Innovation 82, Civic Leadership 34: LJ Hazelwood finished with another double-double as the Ravens picked up their 16th win on the season. Hazelwood finished with 14 points and 14 rebounds, while Carlos Gonzalez and Lester Emmanuel each contributed eight. The game was never close with Innovation effectively putting the contest out of reach before halftime. Southington 49, Simsbury 43: The Blue Knights secured their sixth-straight win on Wednesday night, jumping out to an 18-5 lead and hanging on for a 49-43 win. 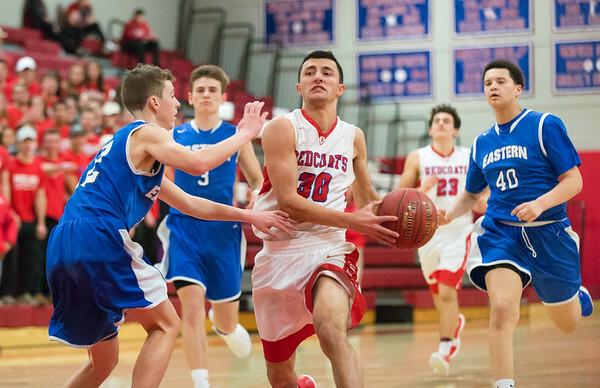 Jared Kelly ignited the Southington offense with four 3-pointers, all in the first half, en route to a 20-point night. Colin Burdette added 17, including eight in the fourth quarter to help the Blue Knights hold off the Trojans. Jalen Williams led Simsbury with 20 points, with 14 coming in the second half, but the comeback fell short. Innovation 50, Civic Leadership 40: Ariana Rivas set a school single-game scoring record with 21 points as the Ravens and added 10 rebounds and six assists to lead the Ravens to their sixth win of the season. Te'ijah added a school record eight assists to go along with 11 points. Breanna Santana finished with eight points and 15 rebounds as well. Simsbury 56, Southington 34: In an opposite showing as the boys, Southington girls came out slow in the first half and couldn’t make up ground in a loss to the Trojans. Just eight points through the first two quarters doomed the Blue Knights, who awakened for 26 in the second half when the game was out of reach. Kelley Marshall led Southington scorers with nine points, while Julia Korp added seven. Kate Sullivan added all scorers with 16 points for Simsbury, while Mary McElroy added 12. Newington-Berlin 5, Enfield 3: Drew Graham finished with a hat trick to lead the co-op, while Ethan Ranger and his brother, Kilian, also scored in the win for Newington-Berlin (11-3). Ethan Ranger assisted on Kilian’s goal. Andrew Fogarty, meanwhile, had another strong night in net, saving 26 of 29 shots. Four of the five Newington goals were scored over the final two periods. Bristol co-op 92, Berlin 88: It was a tough loss for the Redcoats in a meet that was close throughout. Bristol might have had some quality swims, but so too did the Redcoats, namely Kiernan Jennings, who was part of four winning events. Jennings anchored both the 200 medley and freestyle relays in come-form-behind wins. He also won the 50 and 100 freestyles. “He’s been that way all season for us,” Thurston said. “He’s has a great competitive drive. Andrew Roberti won the 100 butterfly for Berlin, while Kurt Bauer and Aaron Gauvin each set a season-best mark in the 100 backstroke. The sports roundup from Wednesday listed Ani LaPointe as Allie Lapointe. Ani LaPointe scored six points, all on -3-pointers. Posted in New Britain Herald, Berlin, Innovation, Southington on Wednesday, 6 February 2019 22:03. Updated: Wednesday, 6 February 2019 22:05.